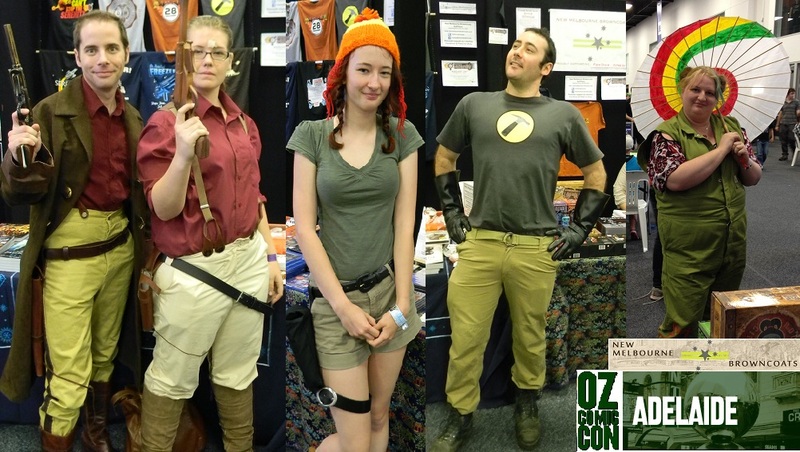 New Melbourne Browncoats, Inc. | Thank you Browncoats of Adelaide & Oz Comic Con! Thank you Browncoats of Adelaide & Oz Comic Con! We had a fantastic time in Adelaide, thanks to the numerous Adelaidian Browncoats and Oz Comic Con! The adventure started with a road trip from Melbourne and (despite all odds) the crew survived! NMB Outfitters was staffed by Jen, Leanne, Michael and Chris, who managed to have the store set up in record time on Saturday morning (despite the road trippers only rolling in at 3am that morning). When the doors opened on Saturday morning, we saw lots of fantastic cosplaying, and were delighted to have so many Browncoats and Whedonverse fans stopping by. It was so great to see how many people remembered us from last year, and are excited about this year’s Can’t Stop the Serenity event. It looks like there will be some road tripping to Melbourne, and we hope that all of the folks who heard about it for the first time will join in this year’s festivities (or band together to organise one in Adelaide)! Our crew were also very excited to meet the guests, and thanks to some amazing supporters, we have lots of treats for those who come along to our fundraising events! After an exhausting (but extremely fun!) weekend, it was time to pack it all up and head back on the road… all the way back to Melbourne! Thank you to everyone who stopped by the NMB Outfitters store for a chat and to spend a little money to help us raise funds for FareShare and Fitted for Work! And thank you to Oz Comic Con for being such wonderful and generous hosts.